Jordan Spieth pumps his fist after making a putt on Saturday at the British Open. CARNOUSTIE, Scotland — It has been the site of triumph (think Hogan) and slapstick (poor Jean) but big, bad Carnoustie has rarely hosted a shootout as thrilling as the third round of the 147th Open. Softened by rain, with only a breath of wind for much of the day, the ancient links was a receptive host to spectacular shotmaking and wild momentum swings. 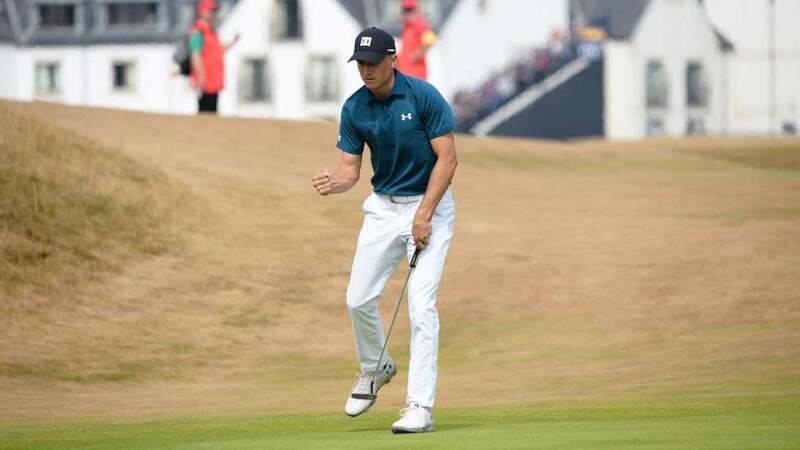 When it was all over, the indefatigable Jordan Spieth had seized a share of the lead thanks to a bogeyless 65, the same score he shot on Open Saturday a year ago to put him in position to win the third leg of the Grand Slam. On Sunday, Spieth, 24, will continue his march on history as he attempts to become only the 10th man since WWI to win back-to-back Opens, a glittering roll call that includes Tiger Woods, Bobby Jones, Arnold Palmer, Tom Watson and Lee Trevino. Last's year Open triumph was about redeeming the debacle at the Masters from the year before. "I don't feel like I have to prove anything to anyone at this point," Spieth said on Saturday evening. "I'm playing golf for me now. I've kind of got a cleared mind. I've made a lot of progress over the year that's been kind of an off year, a building year. And I've got an opportunity to make it a very memorable one with a round." To get there, Spieth will have to fight off Kevin Kisner, who has won once since 2015 but has too much self-assurance to recognize he might be out of his depth. Kisner, 34, shot a smooth 68 to match Spieth at nine under. Over the first two rounds the Kiz was overly reliant on a scorching putter but on Saturday evening he said," Today was the most solid tee to green I've played all week. Really feeling more comfortable with the long game. Did not hole the amount of putts I had the first two days, but the conditions got tough coming down the stretch and made a couple of nice par putts coming in and put myself right in perfect position to have a chance to win." Also atop the leaderboard is Xander Schauffele, who prior to this week could make a credible case at the most underrated player in golf. Schauffele, 24, has won twice in the last year but is playing in only his second Open, having finished a solid 20th last time around. On Saturday he showed a deft understanding of links golf, attacking relentlessly except for the rare times when prudence was demanded. He birdied the fraught 18th hole to snag a spot in the final tee time alongside Spieth. Schauffele is a mellow California dude, and when he was asked if he was intimidated by the pairing he said, "He's such a nice guy. If anything, we can hopefully get something going, and we can start feeding off each other. He won last year, and he's playing great golf right now. So I think he'd be a lot of fun." Plenty of dangerous players are lurking, notably Woods (four strokes back after a 66) and Rory McIlroy, who was within two of the lead until shaky bogeys at 16 and 18, leaving him with 70 that was an undeniable letdown on a day of low scores. McIlroy hasn't won a major since 2014, and in that span Spieth has nabbed three to threaten his standing as the best player of the post-hydrant era. But on Sunday plenty of reputations will be at stake, including the course's. Owing to the ever-changing weather, Carnoustie has played three different ways across the first three rounds. Sunday figures to be even more interesting: the forecast shows rain in the morning, temperatures in the 70s in the afternoon along with the strongest winds of the week, with gusts expected to exceed 20 miles per hour. From the Be Careful What You Wish For Department, Schauffele said," I think everyone's looking forward to playing some real Open conditions." Carnoustie needs the wind to blow, because any links course is vulnerable without its primary defense. In Saturday's benign conditions, Justin Rose went out early and showed that the course was eminently gettable, making birdie on the final two holes for a 64 that tied the best score ever shot at Carnoustie during an Open. Rose was going to miss the cut until his last-gasp birdie on the 18th hole on Friday, and his scorching round moved him up 52 places on the leaderboard. "I kept pushing myself to keep going, keep going," Rose said. "One mental error around here, one bad bounce, one poor tee shot leads to a bogey. One bunker at the wrong time. I kept it together mentally." Rose set the clubhouse lead at four under, but the pyrotechnics were just beginning. Channeling Arnie at Cherry Hills, Spieth drove the first hole and made eagle, just as Tiger Woods was dropping a bomb on the 9th, part of a burst of three straight birdies, including at the 11th when he drove the green of a 382 yard par 4. Kevin Chappell birdied the first three holes, and then Schauffele matched the feat beginning on the 4th. Zach Johnson drained a monster eagle putt on the 6th hole. McIlroy made back-to-back birds. Woods knocked it on in two at the par-5 14th and two-putted for birdie to tie for the lead. Carnoustie shook. But Tiger made a weak stroke on a 4-foot par putt on the 16th hole, posting at five under with a gritty par at the last. His 66 was electric but ultimately not enough. The hottest player in golf, Frankie Molinari, pushed the clubhouse lead to six under with a flawless 65 that included five birdies in his last 12 holes. As the leaders moved to the back nine and the blue sky became cluttered with clouds, the stage belonged to a quartet of Americans of disparate skill and temperament. Johnson was the first to crack, tumbling out of a share of the lead with a disastrous, rough-induced double bogey on the 12th hole. He sits at five under after a 72. Kisner may exude the jumpy, bug-eyed vibe of a guy who has had a few too many espressos, but he hung around the lead by playing flatline golf, parring 11 of his final 12 holes with a birdie on number 14 mixed in for a little variety. Kisner has methodically been building his resumé: he held the 54-hole lead at last year's PGA Championship and was a standout performer at the Presidents Cup. But as is increasingly the case at golf's biggest events, any player who wants to win will have to go through Spieth, who shot a 64 in the final round to nearly steal this year's Masters. Of course, as last year's Open proved, it's rarely uneventful with him. Throw in a quirky links and unpredictable weather and the final round of this Open should be riveting. Says Spieth, "Expect the unexpected."